During Facebook Live chat, Olbermann recalled his experience at Soldier Field in 2007. 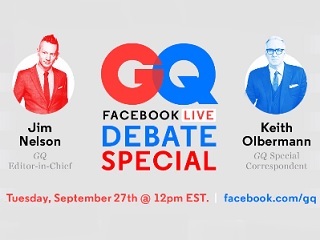 During a Facebook Live chat today, GQ special correspondent Keith Olbermann hinted that hosting a presidential election or primary debate is much like hosting the Oscars. The nature of the job is bigger than any individual’s talents, and ultimately, a large chunk of the audience will be displeased. As is the case with Lester Holt following Monday’s Hofstra University event. In 2007, Olbermann moderated a special AFL-CIO primary debate at Soldier Field in Chicago. Among the seven Democratic candidates participating were Hillary Clinton, Barack Obama, John Edwards and Joe Biden.